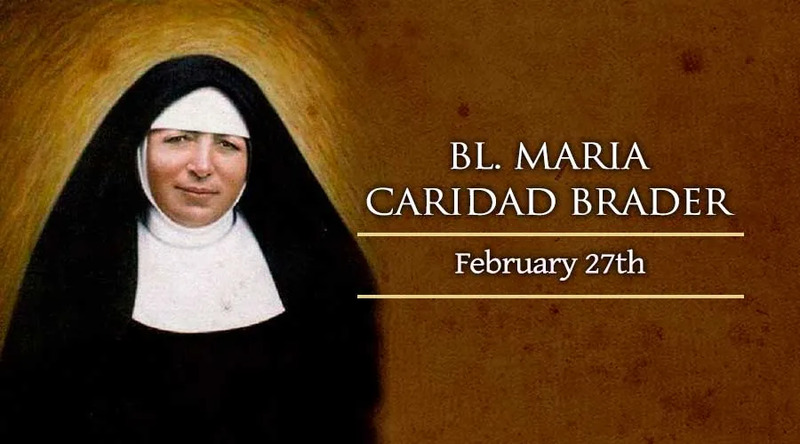 Mother Maria Caridad Brader was born into a pious family in Kaltburn, Switzerland, in 1860. Maria was unusually intelligent and her mother, a widow, went through great pains to give her a good education. Despite her mother's opinion, Maria entered a Franciscan convent in 1880. She made her final vows two years later and began teaching at the convent school. At the end of the 19th century, it became permissible for cloistered nuns to work as missionaries. Maria volunteered to be one of the first of six sisters to work in Ecuador. Maria served as a teacher and catechist in Ecuador. In 1893, she was transferred to Colombia. In response to an urgent need for missionaries, Maria founded the Congregation of the Franciscan Sisters of Mary Immaculate in 1893 in Colombia. Maria served as the congregation's superior general until 1919 and again from 1928 to 1940. Maria urged her sisters to combine contemplation and action with great care. Her congregation also emphasized good education for both the sisters and their students. Maria died in 1943 in Colombia and her grave immediately became a popular pilgrimage site. She was beatified by Blessed John Paul II in 2003.